This episode is the most hateddebatable (there, I said it in politically correct term) one in the BBC’s Sherlock, probably the most succesful hit drama of 2010. I am sure you can find loads of different opinions and critics (especially the lazy writing and so lame stereotypical depiction of Asians) about this episode. I quiet agree with most of them. Thus I’ll just pin-point things I approve and disapprove on the 2nd episode, The Blind Banker. – Chinese shop selling Japanese “lucky cat,” actually known as maneki-neko. Yes, it is so very Japanese item and some had a big problem of Chinatown store selling Japanese stuff. But hey, that’s what Chinatown shops are, all over the world. They sell pretty much everything Asian. I don’t take any offense on this. – “OMG They made all Asians villains! / OMG They killed off all Asian characters!” Well, they ARE mobs and they are bad characters in police drama, right? Of course they’ll get arrested or killed off. It’s not because they are Asian. 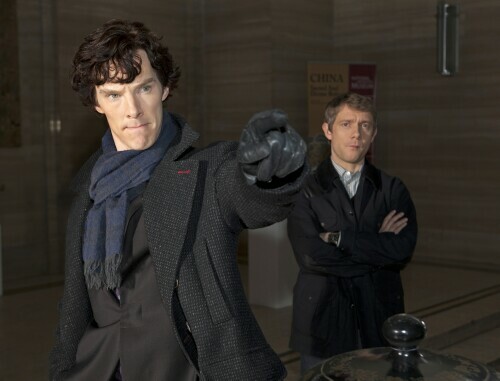 – Sherlock “dumbed down.” Well, please read my 3rd point on Approve section. – “How come there’s no non-whites?” Well, we have to remember that this series is based on Victorian British police novel. – Though I’d prefer sticking with the Canon’s stick-figure passwords, replacing it to Chinese character was not too bad. – A very lazy, stereotypical, unrealistic depiction of Chinese gang: Like please, “Black Lotus?” It sounds like a lame clan’s name on fantasy-based video game. I am convinced Stephen Thompson (the writer of The Blind Banker) did not do a proper research. Had he only refered a bit from Triad or Black Snake Society (the real life Chinese gangs in real world) instead of lame “Black Lotus,” and make sure the gang is doing a proper real-world criminal business (human trafficking into Europe, counterfeit selling, credit card fraud, and/or drug smuggling), the script could be so much better. – Mob boss on the scene doing Chinese circus: Like seriously. Have you ever seen a high-profile criminal revealing his face in public, at the scene? Heck, even low-level Muslim terrorists always cover their face. I give credit for having a woman mob boss though. 2) An Asian woman calmly waiting for her tragic death: Yeah of course! Asians take family relationship so seriously! They don’t struggle against “destiny,” so of course even if a mob member, who is also her own brother, comes to kill her, she’ll be just sad, submissive and wait to die. Er…alright, but usually don’t people panic and run for your life when someone comes to kill you off? Including Asians? Or wait, what kind of professional gang sends a sibling to kill their own family? Usually they assign someone else as a punishment. Stephen Thompson thinking, “Let’s write something exotic and cool…Alright, for exotic, Chinese people. And let’s throw in some Chinese circus because it’s so cool and exotic and mysterious. And yeah, some Chinese letter too. Done and done, exotic and so cool!” I don’t expect BBC to have a Chinese/Asian proofreader or editor. I’m fairly sure Stephen Thompson either has no Asian friends or been to Asia. I’m also very sure he didn’t even google for the things he wrote. Overall, a lazy writing.